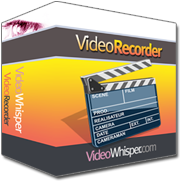 The VideoWhisper Video Recorder software can easily be used to add video recordings to Oxwall. The video recorder allows site users to record webcam videos easily from website pages, including high definition recordings. Oxwall is unbelievably flexible and easy to use PHP/MySQL social networking software platform. Its flexibility is an extremely easy way to change the way it works usin Oxwall plugins. These plugins are complete units of functionality that can be used for various purposes. VideoWhisper provides multiple Oxwall webcam plugins. Upload the plugin from Admin Area > Plugins > Add New from Oxwall administrator interface. Install the plugin from Admin Area > Plugins > Available Plugins : Install . Fill RTMP address obtained at step 1 from Admin Area > Plugins > Installed Plugins : Settings. Also configure Record path (location where rtmp server saves flv) so plugin can delete files when need. You can install and use multiple VideoWhisper communication plugins on same website. Troubleshooting: Flash application stops at login/license screen (can't login). On some web servers you may need to setup writing permissions 0777 for folder ow_plugins/vwvideorecorder/vr/sessions/ if scripts are not allowed to configure these permissions. Or configure web server (ask hosting provider) to use suPHP that runs scripts as account owner with access to account files. The integration is based on a slightly modified php video recorder edition so you can also check that for customizing settings, integration and implementation of other features.